Those seven words weren’t something I could easily say three years ago. 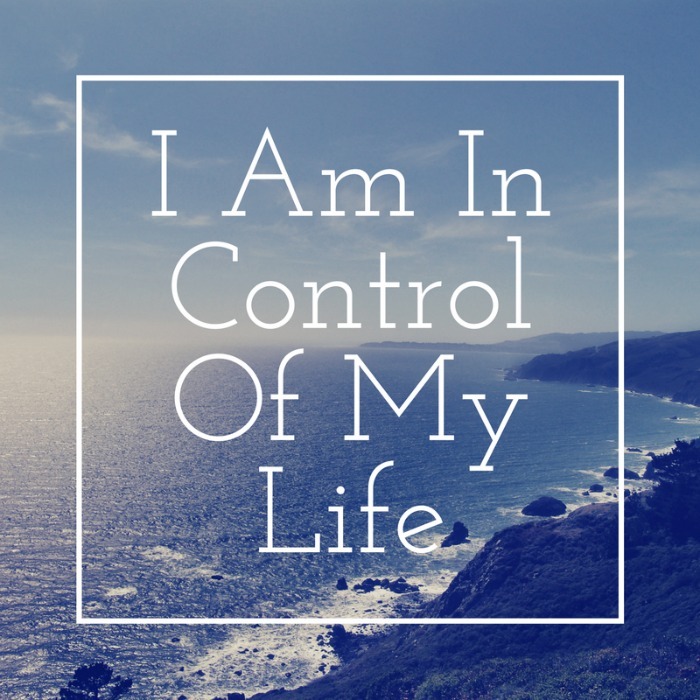 I am in control of my life. After having the twins, I had my husband take a year off work, I was an emotional mess, I had no confidence in my mothering abilities after failing to nurse, and the list goes on. None of that list from the first year with twins says “I am in control of my life.” It didn’t because I wasn’t telling myself that I had control, that I was capable, or that I was good enough. I let fear control me and I failed myself before failing actually happened. I still remember that day that I finally kicked that fear to the curb. Sitting on the kitchen floor, cheeks caked in tears from a trying day of motherhood, I said to myself, “What are you doing? You’ve got this. You are in control.” I repeated that a few more times to myself that day, and have repeated it many times since then. Sometimes we need to give ourselves positive pep talks to get through situations. Whether you’re just trying to get through a rough day of parenting, or keeping yourself out of prison like Letty Raines, reminding yourself that “I am in control of my life” can help you make positive choices. You are probably wondering who is this Letty Raines and why is she trying to stay out of prison? Letty is the main character in the upcoming TNT series, Good Behavior, which is based on Blake Crouch’s novella series. Played by Michelle Dockery (Downton Abbey), Letty is a thief, addict, and mother trying reunite with her 10-year-old son. She’s having a rough go of things as she tries to reform her life after getting out of prison. Good behavior is what got her released early, but her attempt at getting her life back in order keeps facing roadblocks. Prison aside, many of us know what it’s like to be “one more thing” away from the mountain coming down on us. Photo By: VINCENT PETERS Michelle Dockery, Gallery. Letty isn’t the greatest at staying on the path of good behavior, I mean she did meet a handsomely dapper hit man while stealing from his hotel room. Then after stealing from him, gets romantically involved with him before trying to stop the hit. It’s kind of hard to dislike this hit man though, played by Juan Diego Botto, and it’s not because of his good looks. Sometimes bad behavior is for good reasons, and I’m pretty sure he has a thing for Letty. Even after she messed up his job, not once but twice! I recently screened the first few episodes of this drama/crime series and it kept me on the edge of my seat. Now I have to wait and see what happens in episode 4 and I NEED TO KNOW. When you see how episode 3 ends you will be in the same boat. 😀 The 2-Episode Series Premiere is coming up on Tuesday, November 15th at 9/8c on TNT and trust me, you want to give it a watch. I won’t give away any spoilers, but the show continued to shock me scene after scene, in good ways, and I’m looking forward to seeing how the first season plays out! Catch the 2-episode series premiere of Good Behavior on Tuesday, November 15th at 9/8c on TNT. How do you keep yourself positive in bad situations? Tell me in the comments for a chance to win a $100 Visa gift card! Just learn to let it go and move on, tomorrow will be a better day. It’s not worth it! If you just can’t seem to let it go, then you have options go exercise and work it off or just have a good cry and some chocolate. I’ve been through a lot and I stay positive by realizing that things can always get better. I keep myself positive by not comparing myself to others and not letting others harsh comments affect me. When I feel weak inside, I say to myself-you are strong!! I am strong and can do whatever I need to do!! I keep positive in bad situations by telling myself that this too shall pass. I tell myself that I will be okay and tomorrow is another day. I try really hard to focus on the good and to let the small stuff go. I stay positive by giving back to others . I keep telling myself “this too shall pass” and realize that it is persevering through difficult times that makes us stronger. as people. I usually call my parents or talk to my husband in bad situations. They perk me up! I keep myself positive by talking to God and friends. I talk to my husband. I’m a worrier, and he is never fazed by anything, so he helps me settle down. I make my own decisions and trust in myself. I know my pros and cons, my strengths and my weaknesses. I have an amazing husband that keeps me positive, and I pray when I feel that I am in a tough situation. Those two things bring a lot of peace during difficulties. I try to think about the good things in life rather than the bad. I try to keep myself positive, but most of the time I worry and think of the negative. After every rain cloud there IS sun and the bad will eventually get better. I keep positive by talking to my friends and family, talking walks and reading. I take it as it comes. I pray that God’s will will be done and that it will turn out for the best. Praying is the best thing to do. I would tell myself I can handle it…if not, never be afraid to ask for help. I try to remember that this too shall pass. Telling myself not to worry. I keep my focus on the important things in life and surround my self with good friends. It’s hard but I say positive affirmations every morning. I don’t listen to positive tapes like Letty or repeat a mantra, but I know I can overcome any obstacle or bad situation. I try to think of something im grateful for. its hard sometimes. im not going to lie. I stay positive by remembering that I have great support from my family no matter how bad things get. And I always know that others have a much worse situation than mine! When I’m in a bad situation, I remind myself that I’ve gotten through worse so I can do it again. I usually stop to conjure up the worst case scenario. Then whatever I’m dealing with seems not so bad and the right choice seems to present itself. This is a hard one for me because I have panic/anxiety disorder, so bad situations are triggers. That said, I use my deep breathing exercises and will even walk away and take a breather, if I need to. I try to not let my mind take over my body but it can be a struggle. I keep positive by choosing gratitude. I think of all the good things in life and that makes the bad things seem less terrible. I suppose it’s all about perspective. Praying helps me, and a lot of times, just take a few extra moments to think about what you need to do in a situation, and an answer comes to light. I keep positive by serving others. No matter how hard my life is, I am blessed and by helping others, I forget about me. I stay calm and tell myself things will get better. In bad situations I keep myself positive by reminding me of all the things I have to be grateful for. My favorite motto is: An Attitude of Gratitude. Focus on the good things. I keep myself positive in bad situations by looking at a brighter side to emulate being in that better position. I try to focus on the positivity in life rather than the negative.